The award, which is a cheque of 10,000-30,000 euros, is assigned every year on January 9, the birthday of Simone de Beauvoir, to a person or an association for their actions for the progress and freedom of all women all over the world. Mayor Nicolini received 15,000 euros. Doppia standing ovation a Parigi per @giusi_nicolini  insignita del Premio Simone de Beauvoir per la liberta’. Italiani che ci fanno onore! Double standing ovation in Paris for Giusi Nicolini, winner of the Simone de Beauvoir award for freedom! Italians that make us proud! In her acceptance speech Giusi Nicolini was strongly critical of European migration politics. Following the shipwreck that occurred on October 3, 2013 the politicians said “no more deaths at sea”, but instead of activating safe humanitarian channels, instead of promoting peace actions like for example not sending arms provisions to countries at war, they asked for the closure of Mare Nostrum , the humanitarian wing of the Italian navy, which was accused of saving too many lives and of incentivizing arrivals. Also in the last difficult months, the European Union demonstrated hypocrisy, as on the one hand it said we will make a plan for welcoming refugees, establishing quotas as one does for milk, and on the other that Europe is not able to take them. I dedicate the prize to women who arrived here violated, and I will invest it in concrete projects that can save at least some of them from depression and desperation. Elected in May, on the 3rd of November I had already received 21 corpses of people drowned while trying to reach Lampedusa and this thing is unbearable for me. It is an enormous burden of pain for Lampedusa. We had to ask help from the prefectures in order to give a dignified buriel to the last 11 corpses because the municipality does not have burial allowances anymore. We will construct others again, but I have a question for all: how big must the cemetery of my Island be? I’m indignant about the inurement that seems to have infected all, I’m scandalized by the silence of Europe that has just received a Nobel Prize for Peace and that is silent in front of such a disaster that has the casualties of a real war. Everybody must know the meaning of Lampedusa, with its citizens, with its forces adapted to the rescue and welcome that gives human dignity to these people, that gives dignity to our country and to the entirety of Europe. So, if these deaths are only ours, I want to receive condolence telegrams for every drowned corpse that I receive. As if he was white skinned, as if he was our son drowned during a holiday. Giusi Nicolini is fearless in her defense of migrant rights. Last November, she wrote to the local government representative Mario Morcone in order to ask for his immediate intervention in transferring 422 refugees from the refugee centre of the island elsewhere because of “the persistence of the difficult hygenic conditions” following a garbage crisis. In that small area — continues Nicolini — there are more people than there are in Linosa, and I cannot allow these people to live in strict contact with that quantity of garbage. We do not rescue them to host them in a dump. A memo from the district explains that the arbitrary suspension of the environmental hygiene service […] has caused garbage accumulation at the refugee centre of the island. Our aim is to prevent health problems to workers and guests of the centre, that are located in a small area and for this reason are more exposed to the putridity. In an interview last year, Giusi Nicolini invited staff in the tourism sector to not be afraid of the presence of migrants. In fact, the number of tourists to the island has actually increased vis-a-vis other parts of Italy. 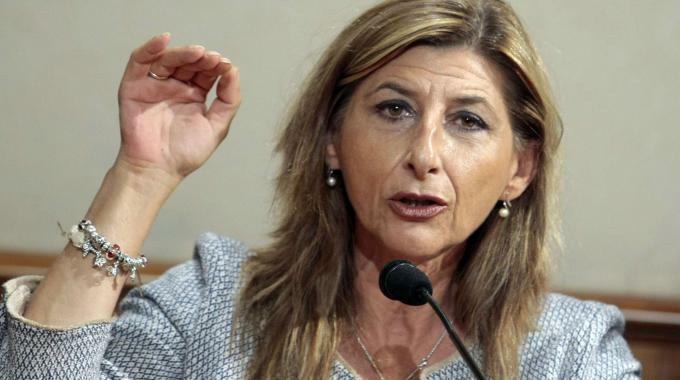 Patrizia Molteni, founding member of Italia in Rete–Réseau associatif Franco-Italien , notes  Mayor Nicolini's repeated attempts to call the attention of European and other world leaders to the situation of migrants, whose conditions have worsened on her island in 2015. Since Spring 2015, the refugee situation has worsened, provoking the opening of new routes. Giusi Nicolini has traced the path and continues her activity despite opposition in order to strengthen solidarity and make Europe and the whole world realise the necessity of changing the inhuman asylum and migration politics. She is the ninth person to obtain the Simone de Beauvoir prize for the freedom of women and remains faithful to her international vocation. The prize is supported by the Simone de Beauvoir Foundation, by the Paris Diderot University, by the Institut de France and by the Paris municipality. Writing in his blog A Sud di Tunisi  Giorgio Caccamo notes that Nicolini's accolades do not end there. She has received praise from Pope Francis and came ninth in the 2014 World Mayor Prize held by City Mayors Foundation  ranking mayors across the world. In February 2015 she was awarded the Prize of the European Citizen  from the European Parliament in recognition of the actions of Lampedusa inhabitants after the shipwreck of October 2013 when 366 migrants died.